Bildhauer, Medailleur, Graphiker und Zeichner (1908–1991). Albumblatt mit eigenh. U. O. O. u. D. 1 S. Qu.-8vo. 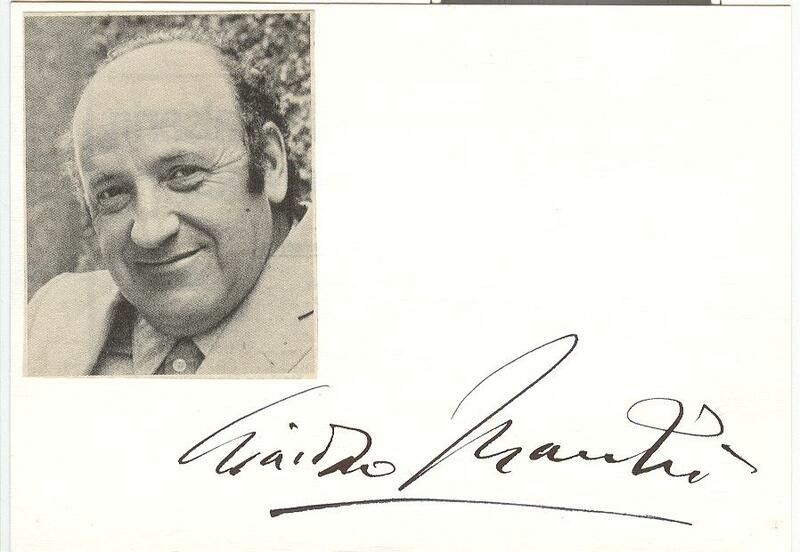 Giacomo Manzù (1908–1991), Bildhauer, Medailleur, Graphiker und Zeichner. Albumblatt mit e. U. O. O. u. D. 1 S. Qu.-8°. – Mit einem alt montierten Portrait (Zeitungsausschnitt). 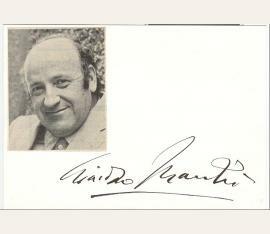 Italian sculptor (1908-1991). 8 letters signed. Milan. Nine pages, on eight quarto and octavo leaves. In Italian. Occasional creases and minor isolated foxing, very good. Accompanied by typescript translations. 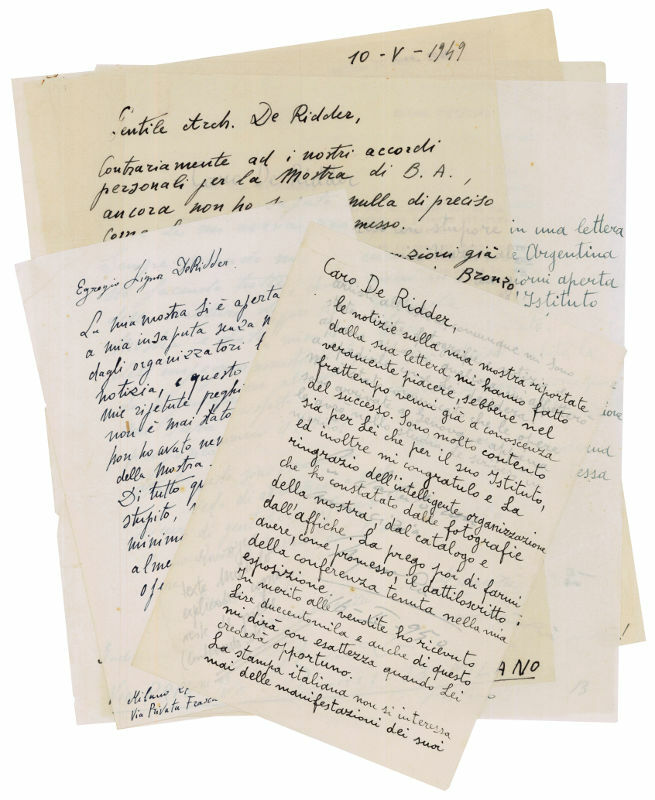 Manzù here writes extensively to Marcelo de Ridder, gallery owner and art dealer in Buenos Aires, concerning the nuts and bolts of an exhibition of his works de Ridder is organizing for late 1949. Always polite, but frequently exasperated, Manzù deals with burdens he feels are de Ridder's responsibilities (customs, shipping, etc), and is justifiably upset when, on 27 December 1949, he writes: "La mia mostra si è aperta e chiusa a mia insaputa senza nessure sapere dagli organizzatori la minima notizia, e questo nonostante le mie risetute preghiere, alle quali non è mai stato risposto. Non ho avuto nemmeno il Catalogo della mostra. Di tutto questo sono veramente stupito, veda di avvicare a quel minimo di gentilezza informandoni almeno dove si trovarro ora le mie opere [...]" ("My exhibition has opened and closed unbeknownst to me, and without my having received the slightest notification from its organizers, despite my repeated requests which were never answered. I did not even receive a catalogue of the exhibition. I am truly amazed at this, could you try to at least have the courtesy to let me know where my works are now [...]", transl.). 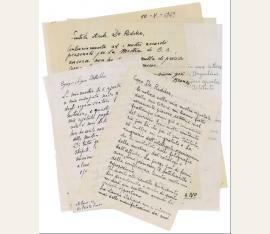 The 16 February 1950 letter is far more conciliatory and grateful, perhaps as a consequence of having received the exhibition documentation and photographs, with which he is pleased, as well as received proceeds so far of "two hundred thousand lire". - Manzù is most widely known for his public works of sculpture, including the bronze doors at St. Peter's Basilica and two reliefs for Rockefeller Center, but was accomplished and prolific in other media as well. During WWII, his anti-Fascist drawings forced him underground, and in 1968 he was awarded the Lenin Peace Prize for his public stance against Western policies in Southeast Asia..